Definition at line 32 of file DebugSubsection.h. Definition at line 34 of file DebugSubsection.h. Definition at line 15 of file DebugSubsection.cpp. 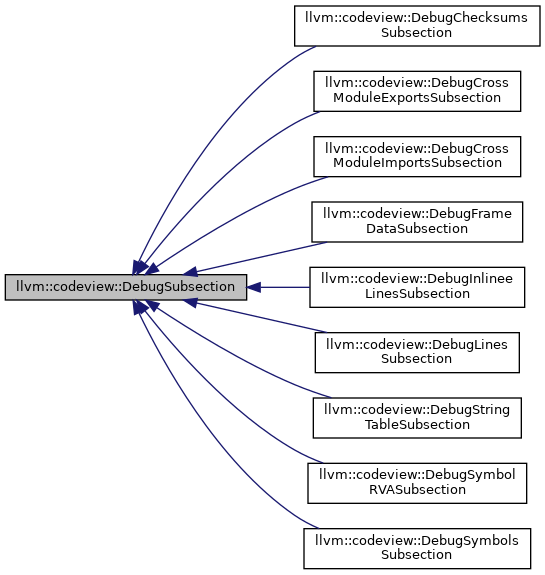 Implemented in llvm::codeview::DebugLinesSubsection, llvm::codeview::DebugInlineeLinesSubsection, llvm::codeview::DebugChecksumsSubsection, llvm::codeview::DebugCrossModuleImportsSubsection, llvm::codeview::DebugStringTableSubsection, llvm::codeview::DebugCrossModuleExportsSubsection, llvm::codeview::DebugSymbolRVASubsection, llvm::codeview::DebugFrameDataSubsection, and llvm::codeview::DebugSymbolsSubsection. Definition at line 37 of file DebugSubsection.h. Definition at line 39 of file DebugSubsection.h. Referenced by llvm::codeview::DebugFrameDataSubsectionRef::classof(), llvm::codeview::DebugSymbolsSubsection::classof(), llvm::codeview::DebugFrameDataSubsection::classof(), llvm::codeview::DebugSymbolRVASubsection::classof(), llvm::codeview::DebugCrossModuleExportsSubsection::classof(), llvm::codeview::DebugStringTableSubsection::classof(), llvm::codeview::DebugCrossModuleImportsSubsection::classof(), llvm::codeview::DebugChecksumsSubsection::classof(), llvm::codeview::DebugInlineeLinesSubsection::classof(), and llvm::codeview::DebugLinesSubsection::classof(). Definition at line 45 of file DebugSubsection.h.